When United States Post Office planes took to the skies in the 1920s, they had their own version of the roadway's yellow line. A series of giant concrete arrows and gaslight beacons helped point the way from New York to San Francisco. 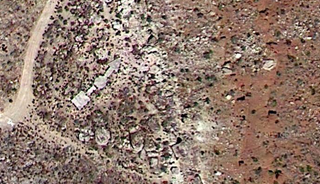 Top image of an airmail arrow near Hurricane, UT, from Google Maps. Airmail planes need to navigate the 2,629-mile-long route regardless of weather and time of day, so in 1923, Congress approved construction of a series of arrows and beacons to guide the planes. The arrows were painted bright yellow, and gas-powered beacons sat atop towers constructed on the arrows' tails. A nearby shed stored gas to power the beacons. By the summer of 1924, these beacons stretched between Cleveland, Ohio, and Rock Springs, Wyoming. By 1929, they spanned the entire route. Improvements in navigation eventually eliminated the need for the beacons, and the Commerce Department decommissioned them in the 1940s. The towers were recycled, but the concrete arrows still dot the landscape, no longer bright yellow, but still pointing the way across the continent. You can see photographs of the arrows and read more about them at Core77, BonnevilleMariner, CN Traveler, and Messy Nessy Chic. Tip of the hat to Tanner!